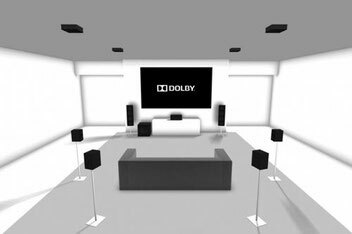 Dolby Atmos - zaradics Webseite! Dolby Atmos® is a revolutionary new audio technology that transports you into extraordinary entertain- ment experiences. Dolby Atmos has the amazing ability to have sounds come from above you. overhead sound from speakers located where your conventional speakers are now. If you already have speakers that you love, you can choose an add-on, Dolby Atmos-enabled speaker module that complements your existing speakers. If you’re willing and able to install speakers in your ceiling, there are great options for creating the ultimate Dolby Atmos experience. Combined with a Dolby Atmos enabled receiver, you’ll be put in the middle of the action – like you have never experienced before. With the revolution in audio that is Dolby Atmos, sound designers are freed from channel restrictions. They can now precisely place and move sounds as independent objects in multidimensional space, including anywhere overhead, so you can hear them as you would naturally. Dolby Atmos is not tied to any speci c playback con guration. If you do not have a Dolby Atmos enabled surround sound system, Dolby Atmos will automatically play in the best possible way for your system. Dolby Atmos is compatible with current generation Blu-ray players. For Dolby Atmos playback, set your Blu-ray player to bitstream out and disable secondary audio.